President's Day is coming soon and many schools and preschools love to explore two of our favorite February presidents. Now that Logan is 4, he's old enough to begin the basics of government. I want some simple President's Day activities. It's important for him to know we have a president and that the president and law makers are chosen by the people of the United States. During the elections last fall, we read a great book called, "I can be President too". Logan's preschool craft made a cute Uncle Sam craft to remind parents to go vote. 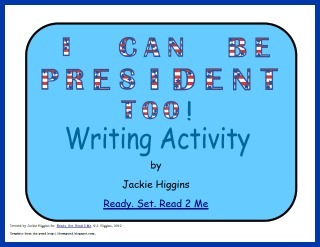 I also created a free writing project for early writers to imagine and write about being president. These activities would all work well for President's Day too! Click the photo to download from my teachers pay teachers store. 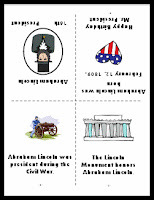 For President's Day this year, we are taking a closer look at George Washington and Abraham Lincoln. I created two FREE mini books about the presidents. These contain very basic information. 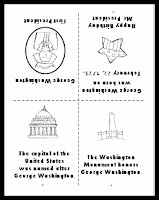 They help students know where the president fell in the order of Presidents of the United States. They offer one accomplishment. The books tell which monument now honors the President. And, they give the birthdate for the President. These would be great to read on the President's birthday or on President's Day. How many presidents have we had in the United States? What year was Washington the President? What year was Lincoln the President? In what war did Washington fight? During which war was Abraham Lincoln president? What other monuments honor past presidents? Where was Washington born? What was the world like when he was born? 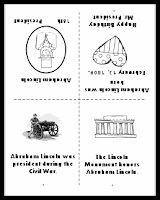 Where was Lincoln born? What was the world like when he was born? The free packet includes both books in color and black and white. Here's how you can get a copy. You can get it free with this link, President's Day Minibooks . It will open in Google Drive. 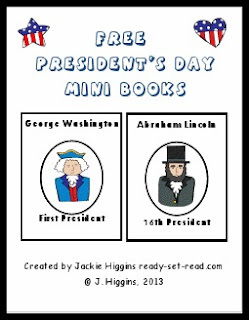 You can download these President's Day mini-book free from my Teachers Pay Teachers Store. Or if you are a Teachers Notebook kind of person, get it here in my Teacher's Notebook store. I'd love if you'd follow my store for more freebies! I love this President's Day book! Thank you. Very professional and still fun for children. Thank you so much! I love these mini books. I will be using these for my two girls I'm homeschooling.